If you own a television and you also like cars – which you do, because you’re here – there’s a pretty good chance you’ll know the name Tom Ford, or Wookie as he likes to be known. 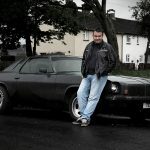 He was one of the faces of Fifth Gear for a few years and soon he’ll be on American TVs as one of Top Gear America’s hosts. It’s safe to say then, that he’s a bit of a car fan. However, while we do enjoy seeing his beardy mush on our telly, it’s his words that bring him here. You see, Tom Ford also writes a hell of a lot of Top Gear magazine features. But you’ll find no consumer advice as the foundation of his stories. No sir, Tom Ford is a man who likes an adventure. That’s why he’s driven a Fiat Panda 4×4 up Mount Etna… while it was erupting. 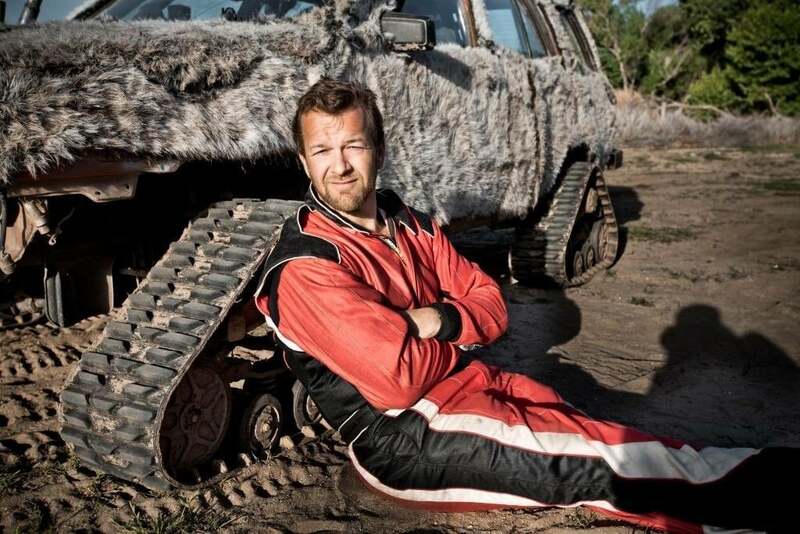 He’s raced a cross-country train in a Bentley. He’s taken an Ariel Atom to the Arctic Circle and, most impressively of all, he let us come to his house once and drink cider. Nice man. As you can imagine, Tom’s driveway is normally filled with something fancy care of a manufacturer’s press office. What he owns though, is quite different. 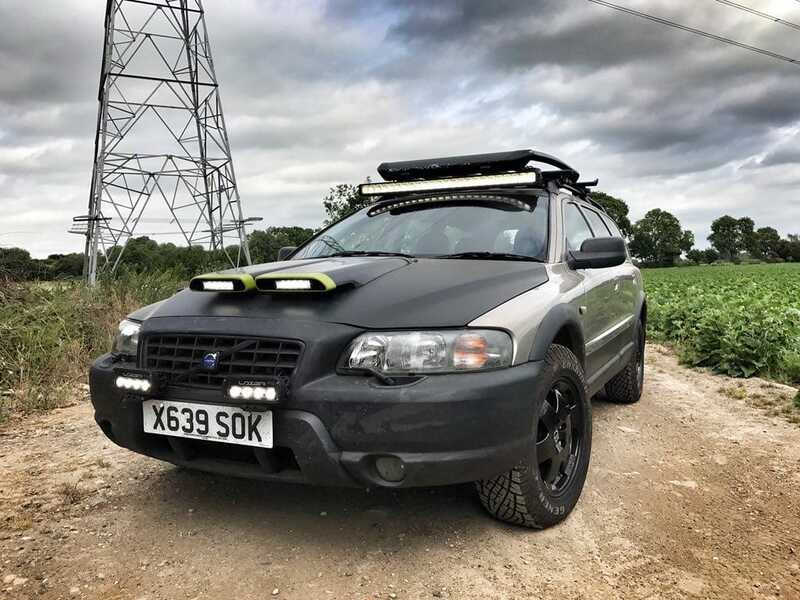 It started life as a humble and somewhat unassuming Volvo V70 XC. Now though, it’s a bit more geared up for adventure and exploration. Tom, not with his Volvo. So what are we looking at? 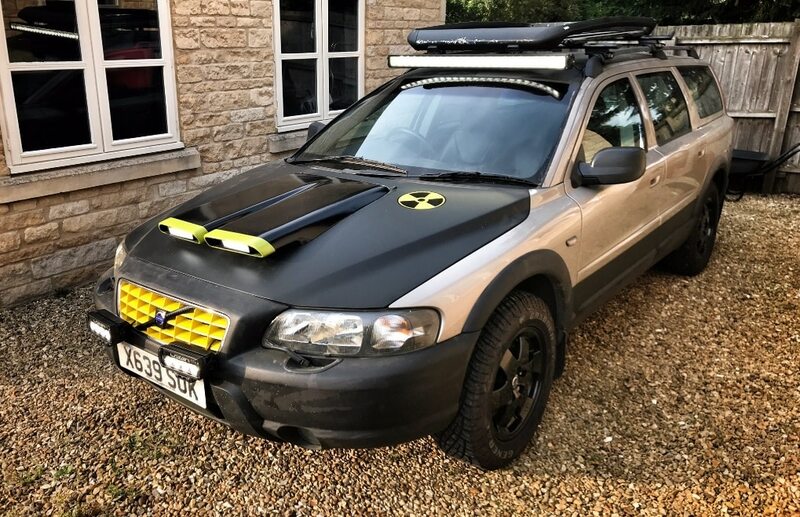 Well, it’s a Volvo V70 XC, or Cross Country. Not to be confused with the XC70 – a name that didn’t come out until 2003. If you’re not familiar, it’s a sort of crossover, which is a normal road car that has a bit more space under its belly (210mm, number nerds) along with bodywork that’s somewhat more forgiving should it hit a tree, or a mountain. Oh, and it has full-time all-wheel drive, giving it a bit more capability outside of the housing development they inevitably live on. Though we don’t mean Tom’s Volvo, obviously. 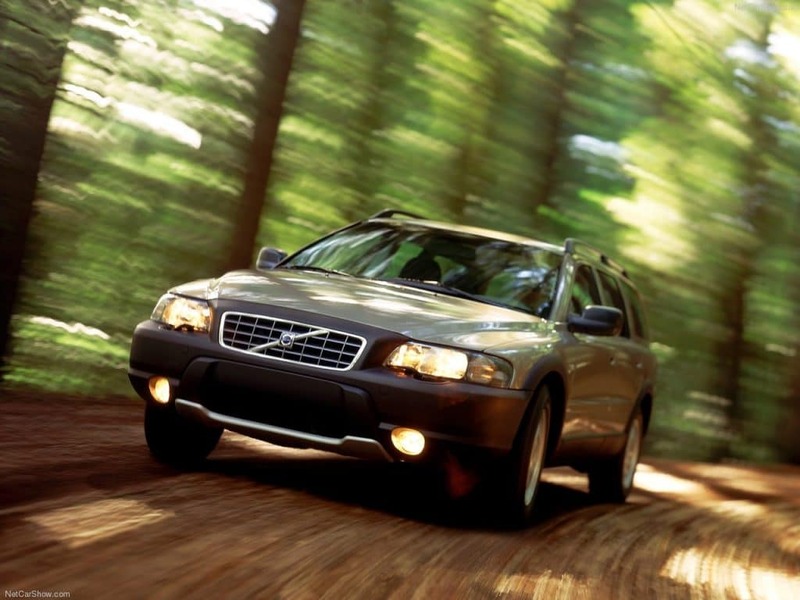 In reality, the V70 XC was a car that sold on its image. But, that does not mean it’s not capable. 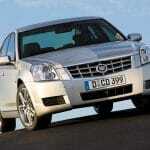 Use it as Volvo’s pencil twiddlers had envisaged and it’s a top bit of kit. Perfect then for some adventures, right? It goes without saying that Tom paid less than £2,000 for his slab of Sweden. Otherwise it wouldn’t be here. It’s a definite bargain, that’s for sure. We’ve been lucky enough to see it in the metal (and plastic) and can confirm that it’s a very tidy machine. It’s also taken a bit more of a rugged turn thanks to some choice modifications. 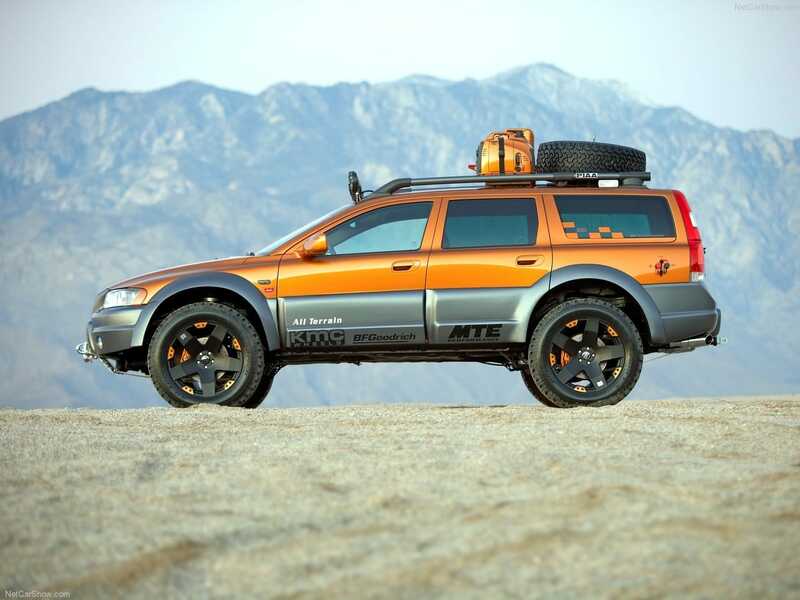 Inspiration came from the wild, but sadly un-built Volvo XC70 AT concept. 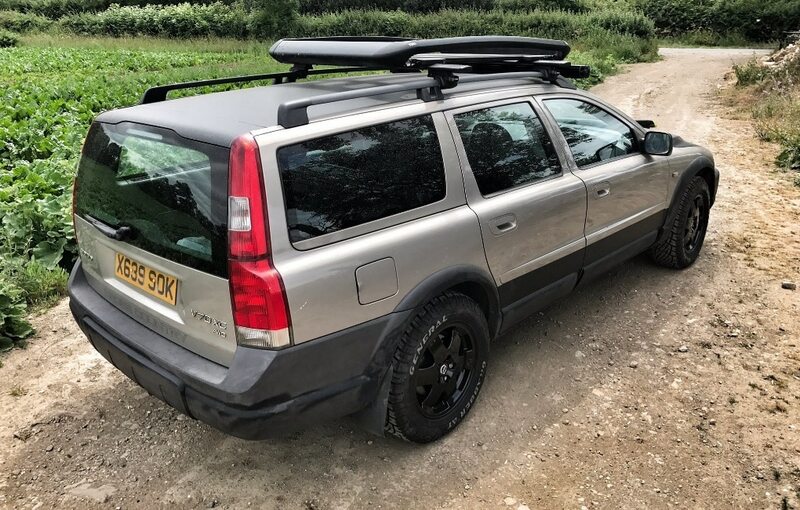 It took the notion of a 4×4 Volvo wagon and sprinted with it, rather than just ran. Jacked up, arches flared, skid plated beneath, roof racked up top and dazzling with an array of lights, it was a beast. Something Tom was keen to try an emulate. The first thing Tom did was get the bonnet and roof wrapped matte black. This is an old racing trick – when you’re out in the Sahara, a matte black bonnet helps stop glare from dazzling the driver. A true fact, that. And it’s also handy given the intensity of the extra light’s Tom’s fitted, but we’ll get to that in a bit. The roof is more of an aesthetic thing. That, or Tom plans to fit an auxiliary seat up top and doesn’t want glare. Anything is possible. The XC70 AT concept – inspiration. The thing is, it’s not always sunny in the Sahara, or in Lincolnshire. The headlights on the V70 XC are good, but they’re not quite good enough. Tom addressed that by covering the car in glue and driving through the storefront of Lazer Lamps. As such, it now has so much front-facing illumination it can actually see through time. You’ll find the same lights on the front of World Rally cars, and if they’re good enough for those lunatics, they’re good enough for Tom, too. If you see him on the road and he flashes you out of a junction or something, you’ll get a tan. Under the bonnet you’ll find a five-pot turbo engine. Just like you get in a Ford Focus ST, sort of. Except in the case of this one, it’s the low pressure turbo. That’s good, it means it won’t blow up. But it also means it’s rubbish for street races on Southend seafront. At the moment it’s been treated to nothing more than a service. Though plans are afoot for a bit of a tune and a snorkel for good measure. Just to give it some serious off-road kudos. Oh, and of course, you can’t really have off-road kudos without some sticky, rock-grappling rubber. So Tom threw some big’ol General Grabber tyres on the stock Volvo rims. 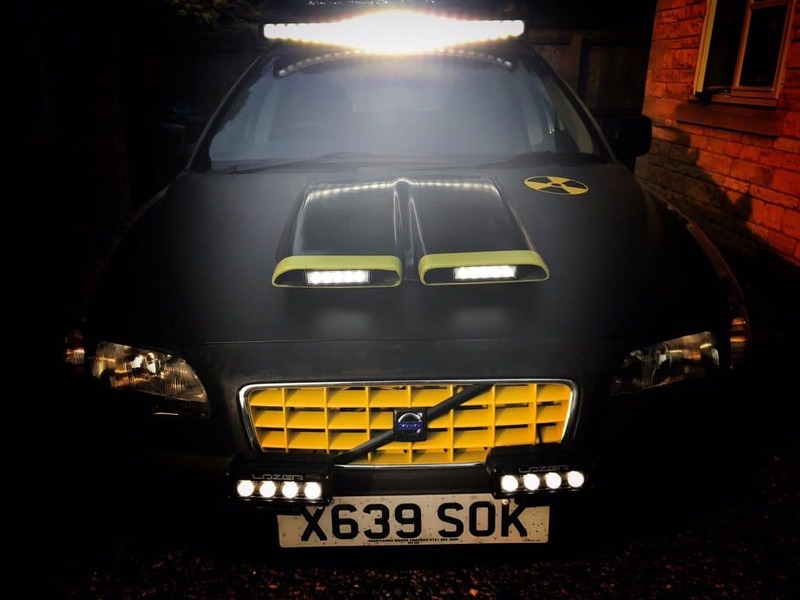 It makes the once humble V70 XC look somewhat… menacing. But in the real world, it should be able to conquer most terrains with ease. Not bad for a bargain wagon. Admittedly, things got a bit out of hand of late, what with the inclusion of lots of yellow and a gargantuan twin scoop on the bonnet. But that’s the fun of a bargain project car; you can enjoy a bit of trial and error. That’s the ownership experience for you. Plus, a new colour is only a rattle can away. It’s been dialed back a bit now, though the scoop remains and raises smirks and eyebrows in the process. It’s a bit of fun after all. And that’s what cheap cars should be. 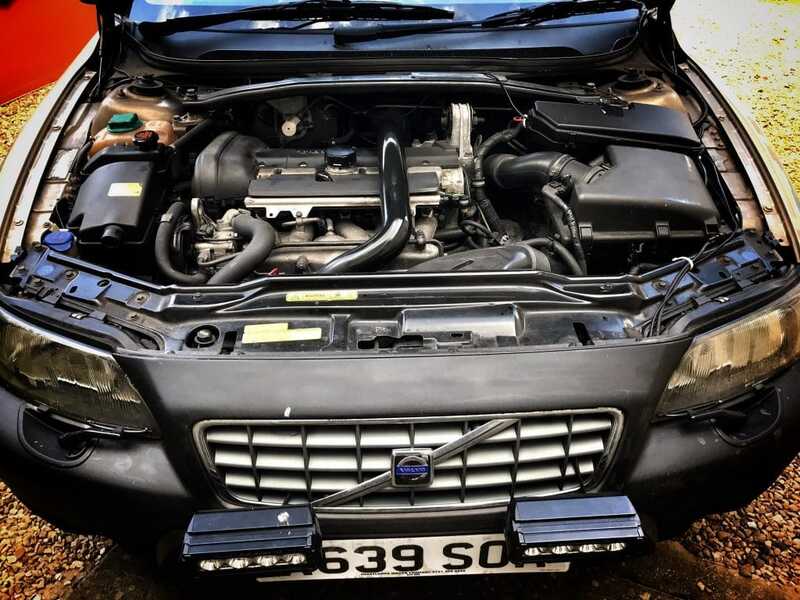 It’s an ethos embodied by this Volvo to the fullest. 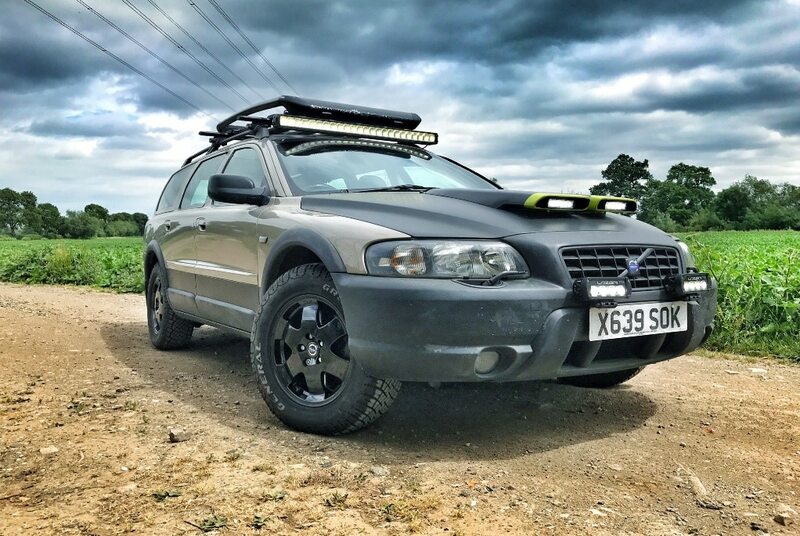 Tom still has some things he wants to do to the V70 XC. A lift of the suspension, that upgrade to the engine to get a bit more power, the snorkel, some more yellow paint maybe? But once they’re done, it’ll be fully adventure ready. Given Tom Ford’s past automotive endeavors, it’s safe to assume that what this Volvo does next should be pretty exciting. And just think, all this for less than £2,000. Sort of. Just don’t ask how much the lights cost.